Humans have been trying to figure out flying machines that work just like birds since before records of such things were kept. Remember the legend of Icarus and Daedalus who were said to have flown on wings made of wax and feathers? The legend – and the very thought of being able to fly like a bird – has inspired mankind for eons. 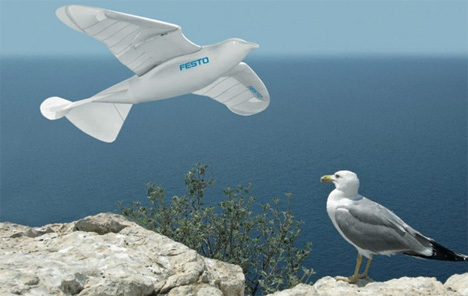 The smarties at Festo’s Bionic Learning Network may not be any closer to figuring out how to make humans fly on their own power, but they’ve created a robotic bird that flies with nothing more than the flapping of its wings. This incredible bionic bird – which Festo calls the SmartBird – flaps its wings just like a biological seagull, mimicking the natural movements almost perfectly. The head and tail move naturally to allow for steering while the wings themselves feature active torsion for maximum lift. The bird is controlled via radio but is also capable of taking off and landing on its own. The whole ‘bot only weighs about one pound and has an impressive wingspan of nearly six feet. And maybe best of all, this seagull won’t explode if you happen to throw it an Alka-Seltzer tablet. See more in Robotics or under Technology. March, 2011.